Beautiful! I need to dig out my ruler and make something. Wonderful quilt! I envy your mathematical skills. The Quick Curve and Mini Quick Curve rulers are favorite of mine and I've made 7 or 8 projects, but don't know how to convert sizes. Thank you for the inspiration! This is beautiful and it's so nice to see a post from you. Beautiful! Glad to see you're sewing. That looks spectacular. Now I wish I had that ruler. lol And to think I could have gotten one at Paducah had I seen your fantastic inspiration. Awesome! I love how it looks like cathedral stars, and how scrappy you have made it. I'm loving this! The colors are perfect. This is gorgeous! 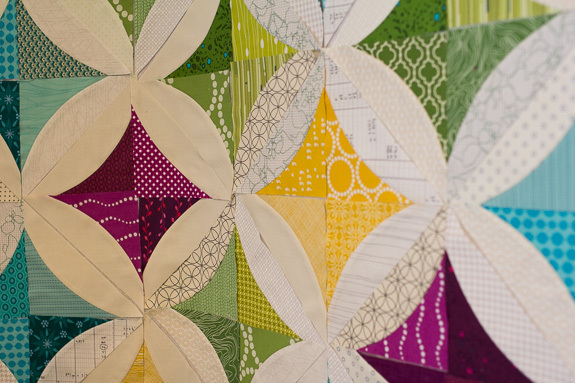 Love that you used the quick curve ruler to make this. Would you consider sharing how you made the blocks? 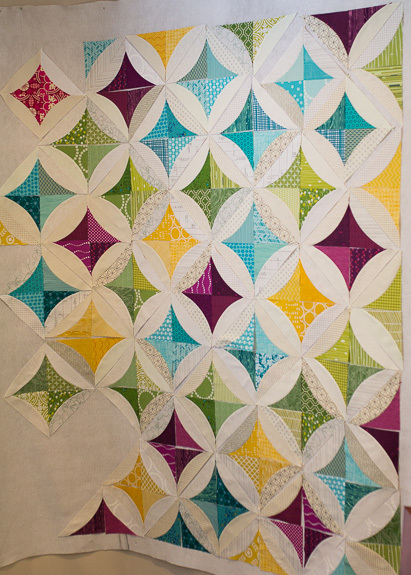 I'm a qcr addict too and would love to make this quilt. Many thanks! What a great idea! I love your use of color in your squares. Beautiful! I, too, love the QCR and wish I could figure out the math to switch between both sizes of the rulers. I have always loved your work, and am excited to see you sewing again!